Lancaster Brooks & Welch LLP is a proud supporter of Pride Niagara for over five years. 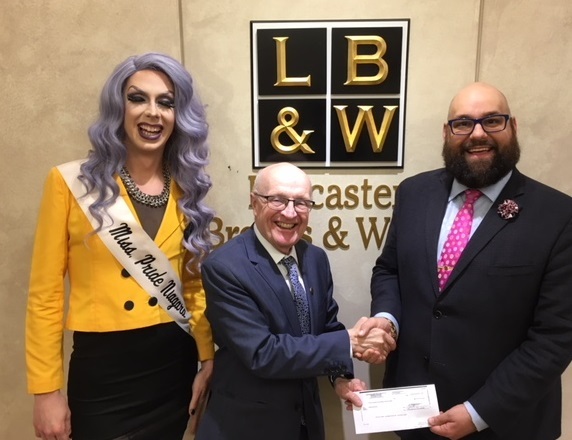 Rob Welch, senior partner at Lancaster Brooks & Welch LLP presents the Rainbow Sponsorship cheque to Miss Pride Niagara 17/18 Cara Scene, and Pride Secretary Douglas Borg. Pride Niagara is a celebration of Niagara’s sexual and gender diverse community and its supporters. They provide social activities and information for the LGBT Niagara Region. For more information on Pride Niagara go to prideniagara.com.